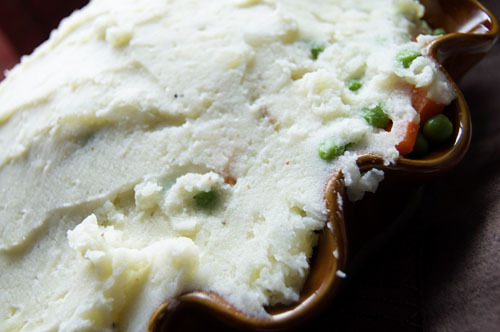 The first time I remember having Shepherd’s pie (which a know-it-all-coworker/good friend just pointed out is actually Cottage Pie because it is beef, not lamb) was with the Neary Family. When we lived in Florida we were lucky enough to have a family live down the street that perfectly complimented ours. Mr. and Mrs. Neary were friends with my parents, the oldest daughter Caroline was my age, and their twin boys, Jack and Noah, were Reid’s age. They were fun, glamorous (having lived in England), and had a cat door that Ryan could crawl through when he wanted breakfast before anybody at our house was awake. They were the best friends we had in that neighborhood in South Florida, it was hard to leave them when we moved back to North Carolina. I loved this pie from the first bite. First of all, mashed potatoes. Duh. Then, peas, carrots, onions, and ground beef. I can’t find a downside. There is no downside. This pie is only upsides. Delicious, creamy, herby upsides. Peel potatoes as you heat a pot of water on the stove. Chunk the potatoes and boil, salting the water, until tender. Combine in a mixer with butter, mayo, and a dash of salt and pepper. Mix until creamy. Salt and pepper to taste. Set aside. Over medium heat, saute garlic in oil. Add ground beef and spices, cooking for 10-12 minutes or until cooked through. Set aside. Heat more olive oil and saute the remaining two cloves of garlic. 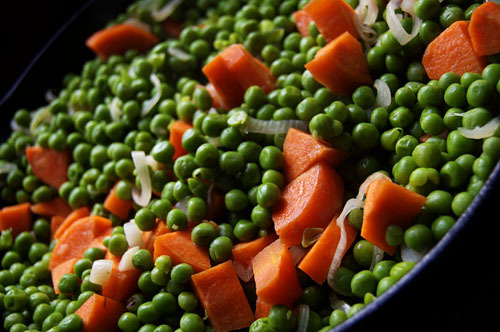 Add in peas, chopped and peeled carrots, peeled and sliced shallots, and a sprinkle of salt & pepper. 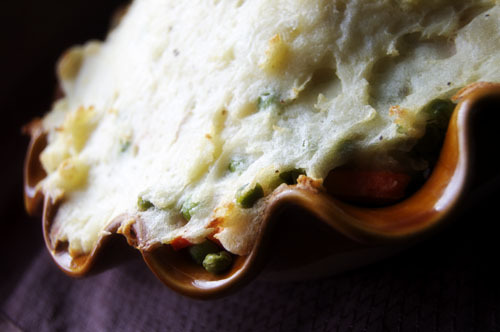 In your pie dish layer ground beef on the bottom, peas and carrots in the middle, and top with mashed potatoes. Bake at 400 for 30 minutes. I love the references, but sadly I do not recall eating shepherd’s pie with the Rosies! thanks for the family shout out – loved it!